Drawing of a sloop, John Thomas Serres, 1789, British Museum. John was the English born son of the painter Dominic Serres. 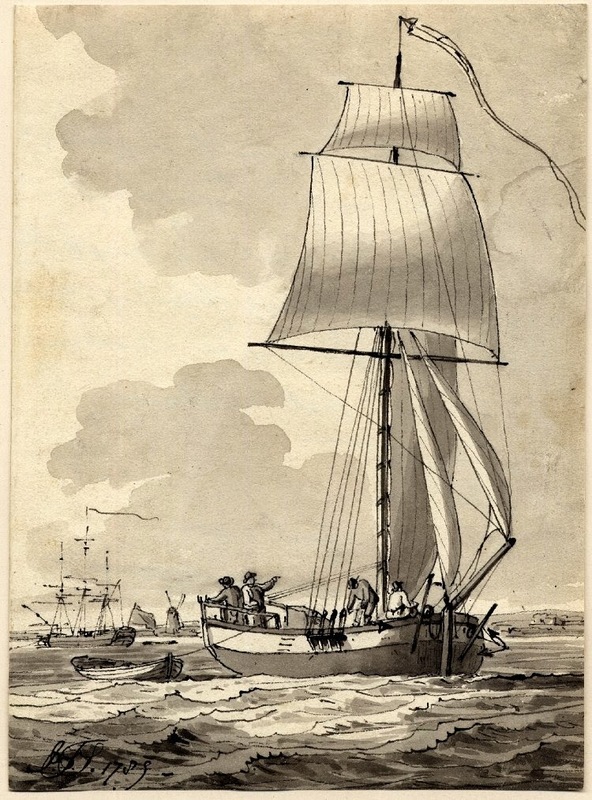 Dominic was a French born merchant captain captured by the English in the 1740's who settled in London and spent the rest of his life as a famous maritime artist. Dominic was a founder of the Royal Academy, which must have cast a rather long shadow for his son! John depicts a small crew aboard the sloop as it rides a stiff breeze over choppy waters. They wear round hats with somewhat wider brims and jackets that end at the waist. They appear to wear white trousers, but only the sailor standing by the mast is in a position for us to see the nature of his trousers. The legs are close fitting, so at least for this tar we can conclude that he is not wearing slops/petticoat trousers.